Kikkerland Design of New York is recalling about 7,300 Kikkerland and Cost Plus World Market brand teapots with bamboo stands. The bamboo votive stand can catch fire, posing a fire hazard to consumers. 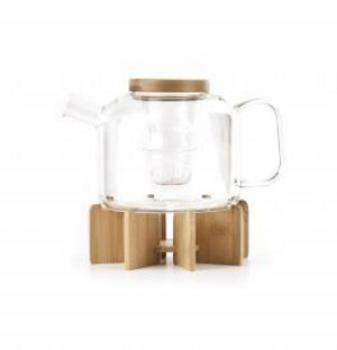 This recall involves Kikkerland and Cost Plus World Market brand teapots with bamboo stands. The 30-ounce glass teapots have a removable glass tea infuser sold with a votive-candle holder inside the bamboo stand. The Kikkerland teapots have model number TP02 printed on the packaging next to the UPC code. The Cost Plus World Market teapots have a white sticker with number 25024784 printed on the packaging. No votive candles were included with the teapots. The teapots, manufactured in China, were sold at Amazon retailers, Cost Plus World Market, Uncommon Goods and Urban Outfitters and online at www.Amazon.com from March 2014, through September 2016, for between $40 and $70. Consumers may contact Kikkerland at 800-727-7151 from 9 a.m. to 5 p.m. (ET) Monday through Friday or online at www.kikkerland.com.